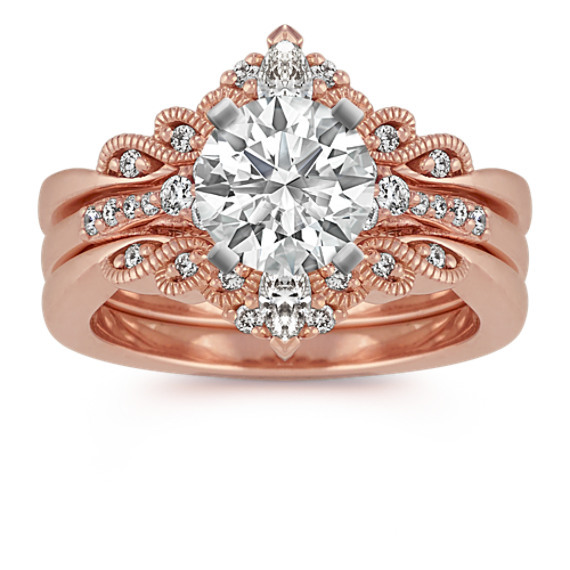 Vintage Diamond Wedding Set in 14k Rose Gold | Shane Co. This stunning vintage inspired wedding set with milgrain detailing features two sparkling marquise diamonds (approx. .17 carat TW) and 38 round diamonds (approx. .29 carat TW). Each diamond has been hand-matched for exceptional color and sparkle. These shimmering diamonds are set in a quality 14 karat rose gold three-ring wedding set and the total diamond weight is approximately .46 carat. To complete the look, add the center diamond of your choice. The engagement ring measures 4mm at the center while both the wedding bands measure 5mm each at the center.